WASHINGTON, D.C. -- With the Senate expected to vote on Thomas Farr’s nomination for a lifetime appointment to the federal bench, U.S. Senator Kirsten Gillibrand today took to the Senate floor to oppose his confirmation. From designing North Carolina’s voter suppression laws, to defending racially discriminatory gerrymandering in court, Thomas Farr has worked to undermine the voting rights for black Americans throughout his legal career. 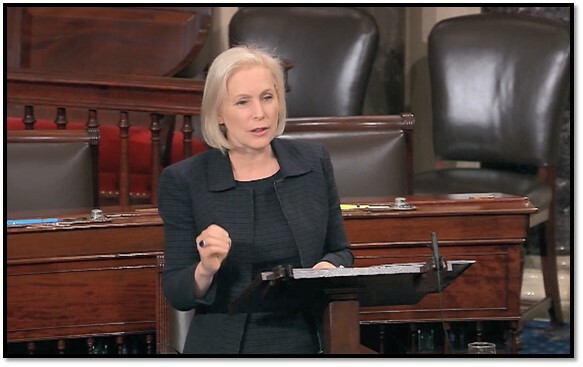 His confirmation would further threaten people’s fundamental right to vote, and Gillibrand urged her Senate colleagues to vote against his confirmation to the U.S. District Court for the Eastern District of North Carolina. "Mr. President, I rise to strongly oppose the nomination of Thomas Farr to the federal bench – and I urge my colleagues to join me in voting against him. The right to vote is sacred, and a precious human right. But it has been under attack – and that is unconscionable and wrong. This nominee represents yet another threat to the basic premise of one person one vote, because throughout his career, he has worked to make it harder for black Americans to vote. That is not who we are as a country, and this nominee does not deserve the privilege of a lifetime appointment on the federal bench. Over and over again, on the most serious and consequential questions related to our sacred right to vote, Mr. Farr has been on the wrong side of the issue. Mr. Farr defended, in court, a gerrymandered Congressional map that was so blatantly racist that a federal Court of Appeals judge ordered it to be withdrawn and redrawn. Mr. Farr defended, in court, state laws that were so obviously designed to suppress the black vote that a federal Court of Appeals ordered them to be struck down. And he wasn’t just a cheerleader for these discriminatory laws. He was the actual architect. He was their defender in court. He did everything he could to keep them in place. That’s why millions of Americans all over the country – including so many men and women of color, the NAACP, the Congressional Black Caucus – are so outraged by this nomination. And they are right to be so – because this nomination is an insult. This seat is the longest judicial vacancy in the country. Just a few years ago, a highly qualified nominee was picked to fill the seat. But she didn’t even have a hearing, let alone a vote. So then another highly qualified nominee was picked to fill the seat, and she didn’t receive a hearing either, or a basic vote. But THIS time, my colleagues are practically tripping over themselves to rush him through the Senate at full speed – to push him across the finish line before the end of the year, and to hand him a lifetime appointment to the court. I urge my colleagues: Reject this bad choice, and let’s find someone better who isn’t so obviously biased on questions related to race. We cannot ignore the fact that this nomination is coming at a moment when so many black Americans are still experiencing blatant and racist disenfranchisement every time they try to exercise their Constitutional right to vote. Just look at the voter suppression that happened in Florida and in Georgia this month in their elections for governor. We have already seen terrible decisions from the federal bench that have rolled back voting rights, like when the Supreme Court gutted the Voting Rights Act. This body has done nothing to address this egregious decision – and we should not be complicit in further eroding this precious right. And now we want to confirm another man to the federal judiciary who has spent his entire legal career fighting to make it harder for black Americans to vote. What kind of awful message are we sending to our country? Mr. President, we must reject this nominee. We must stand up to discrimination and racism in all its forms – not reinforce them, not encourage them. I urge my colleagues to do the right thing and vote NO.